Paging Systems, Pagers, Two Way Radios and more. Our Brand new CS7 coaster pager for customers and guests and our new T7470 transmitter has a unique 'Acknowledge' feature that tells the paging system if the 'page' has been received by the pager - with obvious advantages - this is unique to LRS and this makes all competitive products obsolete overnight! Ask us for full details. And we have now released our CS6 customer and patient pager with most features from the CS7. We will be showing all of our newest products for the Restaurant, Health and Safety and Opticians at trade shows throughout the year. or use our CONTACT FORM and we'll get back to you promptly. 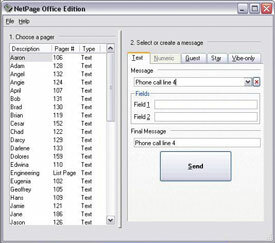 The original Netpage stand alone system software is now discontinued. Used as a PC paging solution with wait lists. This stand alone software has been a leading product but has now been updated to netpage unlimited that works over computer networks and even wide area networking. Please note that our new Netpage Unlimited is available.